This weekend, many of us have had difficulties feeling joy. The school shooting in Newtown has shocked the country, and we mourn for the loss of so many children and adults at Sandy Hook Elementary School. 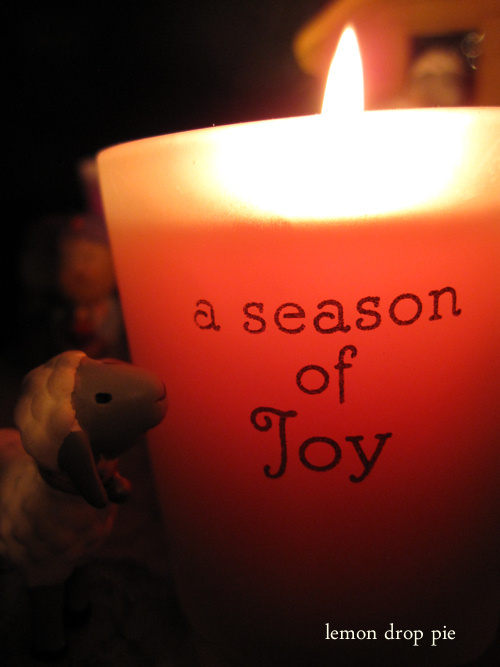 Today is the Third Sunday in Advent, when we celebrate Joy. I wrote this post last year at this time, and I am posting it again. Hopefully it will help give you a glimpse of Joy and Hope that we all need right now. I’ve been thinking a lot about joy lately. It began when I asked my dad a question about our Advent wreath. I couldn’t remember when we were supposed to light the pink candle…was it the third week in Advent? Dad confirmed that I was right, but then he told me why the third week is pink. “Look at the lessons for the third Sunday in Advent,” he said. “You’ll see that they are about rejoicing.” Sure enough, as I looked up this week’s Bible verses in my trusty old hymnal, I found this one: “The desert and the parched land will be glad; the wilderness will rejoice and blossom. Like the crocus, it will burst into bloom; it will rejoice greatly and shout for joy.” Isaiah 35:1-2 And so for the third week in Advent, we are lighting our pink candle. Pink. Pink is the favorite color of many little girls, including Emmy. Pink is so loved that the children’s book Pinkalicious was a best seller and the basis for a kid’s musical and more books. “Pink is perfect,” the little girl declares. Another theory concerns early mapmakers and their special corrective lenses. Because map making required a great deal of attention to detail, mapmakers needed to keep the lenses of their eyeglasses especially clean and scratch-free. It is believed by some that these mapmakers would use rose petals to clean any dust or other contaminants from their lenses. The rose petal’s natural oils would protect the lenses, but often left a rose-colored stain. Therefore, viewing the world through rose-colored glasses would be the equivalent of focusing all of one’s attention on the smallest details and ignoring the realities of the larger world around him or her. Does ignoring reality bring us joy? That’s an interesting thought. It’s definitely more of a challenge to feel joy when we see the reality of life around us. The holiday season is joyful, but it can also be depressing and hard to see joy for some who have suffered a great loss. There have been times when I have burst into tears in the past week. Just decorating the Christmas tree was hard. My daughters each have a collection of Lenox ornaments from their grandma, and they are Lily and Emmy’s favorite ornaments. Emmy asked me why she only had two ornaments, and I barely choked out the answer. (Last year I looked for ornaments in their collections, hoping to continue the tradition, but I couldn’t find them.) Knowing I am expected to celebrate one more Christmas without my mom has been difficult–joyless. And I am not alone in this joyless feeling; I think about it as I drive by the darkened house of a man and son who lost their wife and mom suddenly, at a young age, to a heart attack just last spring. I think about it when I sit next to my choir partner, who lost her mom the same year I did. This reality thing is hard to ignore. Every night, our family has a tradition. We have three purple candles and one pink candle in our Advent wreath, and each week we are able to light one more candle. On the third Sunday of Advent we were finally able to light our pink candle. Oh, the joy! Lily and Emmy were besides themselves over that little, pink candle. They sing our songs with such joy: “Hear us sing! News we bring! Jesus the Savior is born!” They want to dance; they want to sing; they want to lift up their voices! It is almost as if they are right there, at the manger’s side, rejoicing along with the angels and the shepherds! These two little girls, who are by no means angels, are bringing the joy home. I hope in your own lives, in your own way, you are able to find some joy! What a beautiful post Ginny. I seldom watch the news and never read a paper. I like to live in my own little world most days however I couldn't stay away from the news on Friday when I heard it. Finally I had to turn it off, turned on some Christmas music and worked around the house. It was so tragic and deeply sad. I am praying for all of them. Yes, it is so, so sad. I'm glad you were able to turn on some Christmas music, Debby! It's okay to not listen to the news. I've had to avoid it at times this week, too. Beautiful post… and I totally understand what you mean, it's hard to feel joy and even some guilt involved with it… each time I laugh there's a bitter feeling of the parents who are crying right now… when I see my girls playing I think of the little ones who don't understand why their sister or brother isn't there anymore… and it's to painful to bear… but there can be joy… let there be joy… not based on the circumstances but beyond them… Love ya Friend! There is guilt…I certainly have felt guilty this week when I yell at my kids and then realize how lucky I am to have them! Things are getting easier for us as we live our lives, but this week and the future will be so hard for the people of Newtown. I'm sure it will be a long, long time before they can just live without grief. I had no idea that's where the phrase rose colored glasses came from and that it was so multi-layered. Very insightful. This was such a beautiful, thought provoking post. My recent post Civic responsibility, guns, and mental health. Thank you, Larks. I love finding out the origin of different phrases and songs. It is so interesting! I can't even imagine how difficult it is to be a counselor right now to people in Newtown. I am sure they are crying right along with the whole town. I think doing something that makes someone else joyful will help bring back your own joy, too! Thank you for sharing this post again this year. Sometimes it IS hard to see the joy — but the children will lead us, if we let them. My children have really kept me going through some difficult times! Oh, Ashley, I'm so sorry for your loss. It is so hard to lose a parent. I glad this post helped!